Cloud service providers like AWS, Azure and GCP have certified SAP HANA on their cloud platform where IBM softlayer also has certified bare metal HANA certified server options. There are multiple benefits of implementing SAP on cloud. The major once are High availability, Simplified Disaster recovery, and Cost effective compared to other options. But wait there is a caveat!! In order to utilize all above benefits you need to automate many SAP BASIS level activity and also bring governance to development and quality process. I have implemented few automation scripts to automate cost optimization, high availability, and disaster recovery with moderate RPO and RTO. In this post i will show basic cost optimization automation using scheduled starting and stopping of SAP HANA and S/4 application. This script is designed for AWS platform but the same can be converted to other cloud platform as well. 2) SSM agent is configured and EC2 instance is configured with lambda execution role. 3) I have assumed that S/4 (App) and HANA on different servers with distributed architecture. Step 1: Create a shell script Dev-SAPStop.sh for application server graceful shutdown and save the same to /home/ec2-user location. replace <> with SAP S/4 HANA and AWS resource level details. sudo su - -c "stopsap r3"
echo "SAP App service was stopped hence instance is stopped." aws sns publish --topic-arn --message "Development server SAP APP service is stopped. hence we have initiated the instance shutdown." echo "SAP App service was not able to stop hence instance is not stopped." aws sns publish --topic-arn --message "Development server SAP APP or Hana service was not able to stop. hence we have not initiated the instance shutdown. Kindly login to server and stop the same manually." 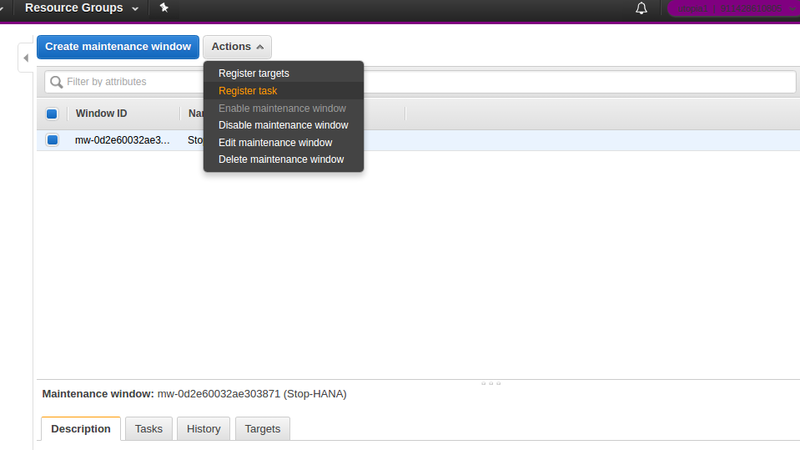 Step 2: Create a shell script Dev-HANAStop.sh for HANA server graceful shutdown. #Initiate Application server shutdown process through remote ssh execution. while [ 5 -gt $times ] && aws ec2 describe-instance-status --instance-id $INSTANCE_NAME | grep "running"
echo Instance $INSTANCE_NAME is not stopped so we can not initiate the HANA shutdown. sudo su - -c "/usr/sap//HDB/HDB stop"
#Check if HANA services are stopped sucessfully or not. 0) echo "SAP HANA Service is successfully stopped"
#Send notification and Execute the lambda function to stop the instance. aws sns publish --topic-arn --message "Development server SAP HANA Service is successfully stopped"
# Invoke Lambda function to stop SAP HANA instance. 1) echo "Hana service was not able to stop. Kindly login to server and stop the same manually"
aws sns publish --topic-arn --message "Development server Hana service was not able to stop. Kindly login to server and stop the same manually." 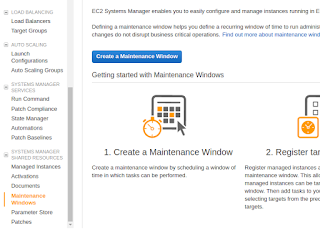 Step 3: Go To the EC2 Systems manager and create a maintenance window and execute Dev-HANAStop.sh script with defined interval. We are using AWS Systems manager because it provides multiple automation and logging benefits compared to cron job. 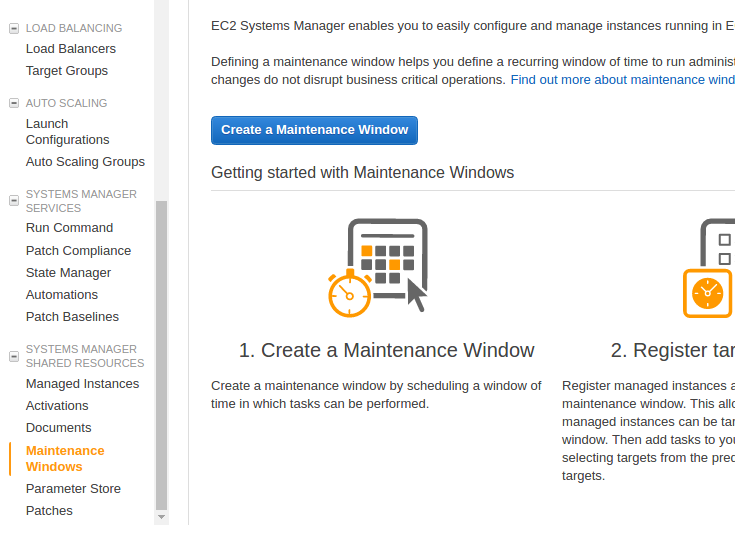 Provide Maintenance window and provide the cron expression schedule along with maintenance window time frame. Once the window is created, now we have to register a server to the maintenance window and configure the execution of script. Select the shell script from the option to initiate the Dev-HANAStop.sh script execution. Select the execution role and execution threshold. The same way we can configure the script to start SAP S/4 HANA. Since this script is too specific with SAP S/4 HANA solution. it should be modified for BW/4 HANA, BO, Gateway, and solution manager.